Okay, raise your hand if Daniel was one of your favorites. Yep, me too. Can you believe Eloise shot him? I have two burning questions concerning this event. 1. Is Daniel really dead? (I really hope not. He brought such an interesting angle to the show and was such a good actor.) and 2. Did Eloise remember shooting him? I mean, did the present (2009) Eloise remember shooting him in 1977 but she went ahead and sent him back to the island anyway? (If so, then she's in the running with Ben for most evil person on the show.) Or is this a new wrinkle in the "present" time of 1977? Desmond (to Penny): "I swore I'd never leave you again, Penny. And I never will." Daniel (to baby Charlotte): "You've got to leave this island and never come back." Okay, raise your hand if you held your breath until you knew if Desmond was going to make it. Yep, me too. I love it that our star-crossed lovers, Desmond and Penny, have been reunited and are living out their "happily ever after", but there's always the ominous shadow of Widmore and the Island looming over them (or would that be the shadow of the statue - ha ha). Will they ever be free from it all? And how could you not get a little misty-eyed watching a desperate Faraday try his best (again) to convince baby Charlotte that she should leave the island with her mum and never come back. It wasn't like Faraday and Charlotte had a lot of on-screen chemistry (no pun intended) or even shared a lot of touching scenes together, but maybe I'm just a sucker for romances doomed by destiny. Maybe his warning will work this time around? Sawyer (to Faraday): "Welcome back, twitchy!" Kate: "This is a mistake. He's talking about erasing everything that's ever happened to us, Jack. It's insane!" Jack: "We disappeared off a plane in mid-air and ended up in 1977. I'm getting kinda used to 'insane'." There are Constants (example: Desmond and Penny's love for each other) which are unchanging throughout time and keep your brain from going crazy and keep you grounded in some way. There are Variables (example: Faraday's ability to change things in the future by altering the past, by giving a message to a Hatch-bound Desmond, to change Desmond's actions in the future). Humans are the variables. What happened, happened. This phrase has been repeated a lot and seems to imply that nothing can be changed, no matter how hard they try. Yet how do you explain people that were born in the 70s, existing as twenty-somethings in that very era? Ouch! That makes my brain hurt. This is your "present". We also know, from Miles' convoluted discussion with Hurley, and mentioned also by Faraday in this episode, that wherever you are in time, that is your "present". You have free will (I think this was implied) to make new choices that might change time. The universe will course correct. Yet we've also been told that the universe (or destiny) wants things a certain way, so even if you try to change things, it will use other events to "course correct" so that it will come out with the same result. Are Desmond and Penny an except to this rule? It was implied that Desmond was "special" and it seems Faraday is too. Are there certain "special" people who are not bound by "destiny" and can determine their own fate? Ooo - good stuff to ponder on! Perhaps we can throw all this out the window though, because even Ms. Hawkings said, "For the first time in a long time, I don't know what's going to happen." Join the club, Ms. Hawkings, join the club. That's how all us Losties have felt for the whole season! This was a tremendous episode! I don't think I took a breath through the whole thing! I wonder if Faraday is adopted or is he a genetically engineered child? Are Daddy Widmore and Mommy Hawkings really his biological parents? They seem to be in more of a forced partnership over manipulatively guiding him towards his "destiny" than they seem like actual parents. And if they are his parents, why is his last name Faraday? Is he named after the scientist who created him? Are Penny and Daniel brother and sister? Or maybe they're test tube cousins? And I wonder if the hydrogen bomb is the thing that is "in the shadow of the statue." Leave me a comment and let me know what you picked up on! On last night's episode, we learned that you're not a character on LOST if you don't have daddy issues! It was a Miles-centric episode, which means this is the first time we had a flashback that focused on one of the freighter folk. I've been dying to know Miles' story since we first knew he was a ghostbuster. Ghosts and the whole "I talk to dead people," thing interests my morbid little sensibilities, so I was pleased with this show. Now we know Miles' personal reasons for wanting to get to the island (although I don't think it was a surprise to any of us that he ended up being Dr. Chang's son). I find it interesting that Miles is unashamedly driven by money and can be bought. Was it because he grew up in a single family home and they never had enough money? Ilana and Bram don't work for Widmore! It was hard to find a shocking moment this evening. Based on the things Bram was saying to Miles in the van, it was implied that they don't work for Widmore. Does that mean they work for Ben? Or maybe they work for Jacob/Richard? I didn't think Jacob or Richard had any doings off-island. Then again, Richard did recruit Juliet. What is Bram and Ilana's purpose on the island? What's in the silver cargo box? The adult Miles looks through the window to see his father holding him as a baby. How could you not watch that scene without getting a little teary-eyed? Here's a question for you - Did Dr. Chang kick his wife and son off the island because he discovered the adult Miles was there, and was afraid of ripping apart the space/time continuum, because of the Self-Preservation Effect/Theory, that two versions of one person can't occupy the same time/space? (Credit goes to my husband for coming up with that theory.) Or does he send them away when the accident happens when building the Swan? Dr. Chang does seem like a colossal jerk. Maybe he just becomes consumed with his work on the island and sends them away because they are a distraction? Miles: What happened to him? Dharma Worker: He fell into a ditch. Miles: Is that a gunshot? Did the ditch have a gun? This week, we got to see Charles Widmore's hairline receded through the years, discovered one of the reasons why he was banished from the island (having a child with an "outsider"), saw Locke walk around with a smug and knowing look on his face, learned more about how and why Ben kidnapped Alex, how he got so bloody during his errand to the marina in L.A., and we actually got to go inside the Temple, and meet Smokey face-to-face. What an intense, engaging episode! Here are a few of my favorite moments. Ben shoots Caesar (who is unarmed) at point-blank range for no reason. Desmond tackling Ben seconds before he was going to shoot Penny. Ben is an evil, evil conniving man. He totally planted the seeds of doubt in Caesar's mind about Locke and set him up, to turn him against Locke, just so he could "save" Locke from him, to get back in Locke's good graces. We had seen enough of Caesar, that I didn't think he'd end up being a red-shirt. Ben has absolutely no qualms about killing innocent people for selfish reasons (i.e. the entire Dharma staff, all the people on the freighter, and now Caesar). But let's talk about the even more intense, edge-of-your-seat, nail-biting moment of the night... the showdown at the marina! I was so nervous that Ben was actually going to succeed in killing Penny. The writers of this show are known for not being afraid to kill off main characters. And they ran it up to the last second, didn't they? I could hardly look at the TV screen. When Desmond tackled Ben, our little viewing party erupted into cheers! Whew! What a relief to know that Penny is okay (at least for now). Did you catch it that the name of Penny and Desmond's boat was "Our Mutual Friend" - the name of the Dickens book that Penny gave Desmond when he went into prison? Ben sees his time raising Alex pass before his eyes, via Smokey-vision. Watching Ben, as he saw his life with Alex literally flash before his eyes, caused a strange mix of emotions in me. Ben is so evil, so calculating, such a control freak with a selfish ego, but yet, to see him in moments like this one, my heart ached a little bit. Did he really have love for Alex? Was he really tenderhearted towards the baby, and that's why he couldn't kill her (or her mother)? Or did Ben just need something to love? It seems like all his actions are fueled by selfish motivations, so I suspect it was the later. Speaking of Ben's judgement by Smokey ... the hieroglyphics on the wall above the Smokey vent in the floor showed Anubis, god of the dead in Egyptian mythology. If I remember right, he was also the one who weighed the good and bad actions of a person's life, before letting them in to the underworld. I had suspected from the glimpse we got of the giant statue, that it was an image of Anubis. Now we see this hieroglyph of Anubis summoning what appeared to be a representation of the smoke monster. Too cool. However, I don't think Smokey/Anubis/The Island forgave Ben during the judgement session. Rather, I think the island let him live so that he could redeem his sins by following Locke and helping him, as the Island commanded him to do, in the form of Alex. The appearance of Alex just lends proof to my argument that Smokey/The Island manifests itself in the form of dead love ones. Thus Christian isn't really Christian, but just one of the many forms The Island uses to appear to people. Ben (in reference to summoning Smokey): "It's not a train, John, it doesn't run on a schedule." 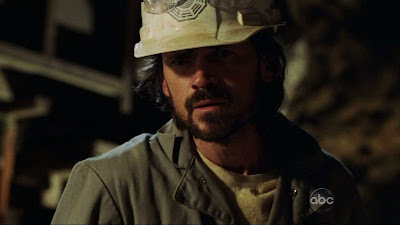 Locke (in reference to Ben's lengthy explanation of why he killed Locke): "I just wanted an apology ..."
Ben actually had several dry, sarcastic funny lines in this episode. I wish I could remember some of the other ones. This is yet another show that I could stand watching again, to make sure I picked up on everything. It was very intense and entertaining. 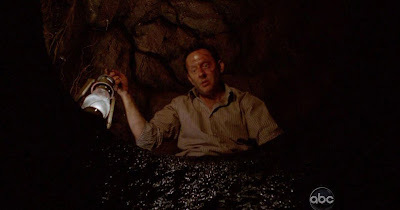 It was interesting to have a Ben-centric episode, and see what life was like on the island "back in the day". After five seasons, we still know so little about the Others. We got to see a little bit more in this episode, with Charles Widmore and Richard Alpert. But as always, we were left with more questions than answers. For example, here are some questions that are nagging me. How did Ethan end up with the Others? Did he defect from Dharma to the Other's camp with Ben before the Purge? Why did the Others accept him? Was it because he survived being born on the island? Does that instantly make you an Other? Is Ilana and those other dudes working for Widmore? What's up with her question "What lies in the shadow of the statue?" Is she an Other? What's in the silver crate? Maybe when Ben called Widmore from the marina and said he was going to go back to the island but was going to kill Widmore's daughter first ... maybe that's how Widmore knew Ben had found a way back, and put his people into play? Maybe he checked the airline databases to see which flight Ben was on, saw that the Oceanic 6 were on it too, and had Ilana apprehend Sayid and get him on the plane too. That would've had to have been some fast work on his part. Also, what is Locke's relationship to the island now? It seems like he was the Chosen One all the long to lead the Others (from the time he was a baby). If so, why did Locke fail Richard's test when he was a boy? And how does Locke think he can get the 1977 crew reunited with the 2009 crew? Do you have a theory? Please leave me a comment and let me know what you think. Jack: "I said, no. I'm not going to help save Ben." Mr. I-Need-To-Fix-Everything, had an opportunity to fix something and he said no?! I was totally shocked. I really appreciated it that Jack brought up what Ben had done to him, locking him in a glass cage, and how the only reason he operated on him last time was to save Kate. You could see the history of that emotion in his eyes. I think it's hard, when an audience like us, is involved in a piece of work with this much scope and depth, to remember everything that has transpired to these people. So I was glad for him to remind Kate (and the viewers) of some of that history. I loved it too, when Kate said, "I don't like this new Jack." and he said, "You forget Kate; you didn't like the old Jack either." Snap! Guess that relationship is OVER. And was it me, or did Jack sound a lot like Locke when he was talking about the "The Island" and how it might be trying to fix things on it's own and he was just going to have faith and not interfere anymore. I guess Jack has given up the Savior-complex, the need to help, the need to make things right, and is at some kind of weird peace now. What a change for his character! It's kind of creepy... I'm interested to see where he's going. Kate saying good-bye to Aaron. I find it interesting that Kate - who didn't like kids, didn't want to be tied down by a kid, was always on the run - finally found stability and love by taking care of Aaron. It was so heartbreaking to see her walk away. 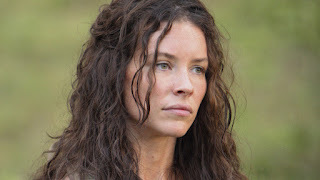 I think there was a lot of unspoken emotions in several of the scenes with Kate and Aaron and Sawyer's ex, Cassidy. Her discussions with Cassidy were enlightening. Although I wasn't too sure about Cassidy's take on Kate's situation with Sawyer, until later when Kate confronted him and he confirmed it. I guess that relationship is OVER too. I appreciated it that Sawyer admitted he'd "grown up a lot in the last three years." Also, I didn't realize that each of the Oceanic 6 had a different, more personal reason, for coming back to the island. I just figured they all came back to save those that were left behind, and because Ben told them they needed to. Sun's purpose is to find Jin. Sayid decided his purpose was to kill Little Ben. Jack doesn't know what his purpose is yet. Kate's purpose is to find Claire. I didn't see that one coming! I was so surprised and glad that her reason was more noble, than just simply coming back for Sawyer. Hurley: "Uh... that was really confusing." Wasn't Hurley and Miles' discussion about time travel just great? Leave it to Hurley, to ask the practical questions that would be bugging anyone in that situation. And kudos to the writers for finding inventive ways to explain things to the audience without looking too obvious about doing it. I may have to watch that scene with Hurley and Miles a couple more times, to get my head straight on all this time travel business. I think the bottom line is that "whatever happened, happened" - they just haven't experienced it yet, with their present consciousness. Speaking of time travel... Before the Oceanic 6 intervened in the past (1977) how did Ben become an Other? Would he have become one if Sayid hadn't shot him and caused that chain of events? Maybe this is just the universe course correcting? What do you make of what Richard said - that if he takes Ben to be healed, he will not remember any of this, will lose his innocence, and will "always be one of us." So it's Sayid-Kate-Jack-Sawyer's fault that Ben becomes evil? Would he have become evil anyways? What do you make of the Other saying that Ellie and Charles won't be happy, but Richard said that they're not in charge of him. And what's up with that temple? When will we get to see inside it? What do you think? This episode has got me thinking about so many things... including some of the deeper themes of the show that haven't been as predominant in a while. (It's like the writers were reading my blog post from last week! ha ha) What do think about the importance of having a purpose in life? (i.e. each person having a purpose for returning to the island) Can we fight against our fate or destiny, or are we doomed to be evil, or cursed, or alone... etc. Leave me a comment and let's discuss!